Fruit Skewers make serving fruits exciting! Some call it Fruit Kebabs or simply fruit on a stick. It goes well with Grilled Tilapia. 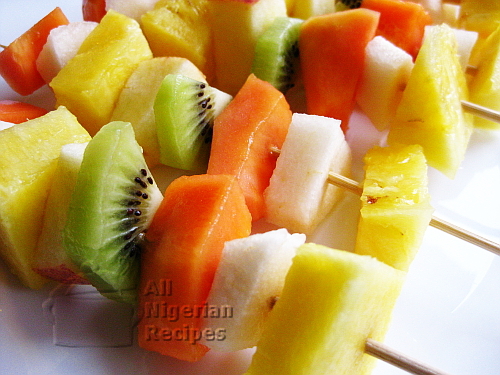 The following are my favourite fruits for Fruit Skewers. I change them up all the time. So always use your favourite and colourful fruits for this. I sometimes add crunchy vegetables. Wash, peel and cut the fruits into medium pieces. Thread them on the skewers, alternating the colours for a nice look. When done, rub some honey on the fruits and sprinkle coconut chaff.